After meeting Jason Reynolds last October at the Texas Teen Book Festival, I knew I had to read his books. 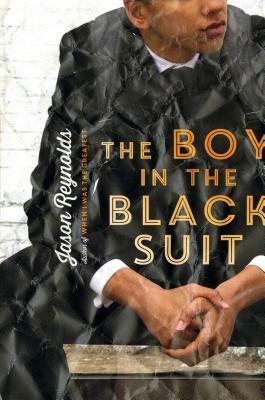 Sadly, I didn’t get around to it, but after I met him AGAIN at Texas Teens 4 Libraries, I got a free copy of his book, and I sat down to read The Boy in the Black Suit. And oh my word was it good. When I’ve interviewed Jason, we spoke a lot about poetry, and when I read The Boy in the Black Suit I immediately saw his poetry background shining through. The imagery, emotion, and language of it are what make it so incredible. The symbol of the black suit that Matt starts wearing everyday is a powerful one, showing who Matt is and who he’s becoming. The gritty language of the story makes it incredibly unique and pulls you into the story, setting the scene and making you feel more connected to both the story and its characters. And the emotion. This book is raw emotion. Matt’s heartbreak, his pain, his hope, his disappointment – it’s all there. From the moments when he breaks down to the moments when he holds his head up, you feel everything. Matt is by far one of my favorite male main characters in YA literature, and I wish there was more of his story, because I need more. This book flat out floored me. It moved me in ways I haven’t been lately, especially emotionally. I just wanted to give Matt a hug during the entire book! Matt’s story, from his mother’s death to his new job at the funeral home to his best friend (who I adored) to his new romance for Love – it all fit perfectly. He’s an extraordinarily real and relatable character that I will definitely not be forgetting. Everyone needs to read this book. They need to hear Matt’s story. And then they need to go tell Jason Reynolds how incredible of an author (and person) that he is, because it’s so true. Previous Previous post: TANGLED WEBS: The Historical Imagery Is Fantastic!